The challenge for this week over at Winter Wonderland is to use an Aperture somewhere on your Christmas project or card. The DT have created some truly amazing cards this week to help inspire you to start on your Christmas cards now :o) Why not pop over and have a look. We have a lovely prize on offer too, for one of our lucky challenge participants this week! All products are from Stampin' Up! unless otherwise specified. WOW hun, I'm seriously loving this!! Fabulous job with me little tree!! Great idea to have the aperture for the sentiment too! Really pretty card, I love that the aperture isn't the obvious! ooooh this is gorgeous! I love the style of this card and especially the way you have done the aperature. Teri this is a beautiful Christmas card. I love that image and this color blue!! Very pretty! This is just so elegant Teri and a very clever idea to use the aperture for the sentiment. I would have never thought of that! Beautiful colours. SO pretty Teri! 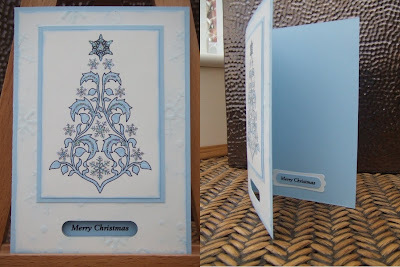 The blue is gorgeous and the simple lines make this such an elegant card! I love the sentiment in the aperture! Teri!! Wow. your card is stunning!! Love the digi image and what you've done with it. The colors are perfect and I adore the word window punch out part of the card. It really is stunning! Vintage Vogue and Open House!!!! !